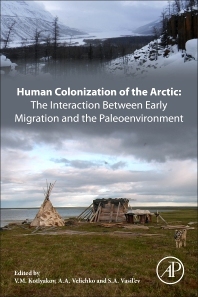 Human Colonization of the Arctic: The Interaction Between Early Migration and the Paleoenvironment explores the relationship between humans and the environment during this early time of colonization, utilizing analytical methods from both the social and natural sciences to develop a unique, interdisciplinary approach that gives the reader a much broader understanding of the interrelationship between humanity and the environment. As colonization of the polar region was intermittent and irregular, based on how early humans interacted with the land, this book provides a glance into how humans developed new ways to make the region more habitable. The book applies not only to the physical continents, but also the arctic waters. This is how humans succeeded in crossing the Bering Strait and water area between Canadian Arctic Islands. About 4500 years ago , humans reached the northern extremity of Greenland and were able to live through the months of polar nights by both adapting to, and making, changes in their environment. Dr Kotlyakov is a world leading glaciologist, investigator of both Arctic and Antarctic regions. He is one of the early researchers to substantiate the relationship between human activity and climate change. In fact, V.M. Kotlyakov is a laureate of Nobel Peace Prize given in 2007 to the Intergovernmental Group of Experts for Climate Problem. The late Dr Velichko was one of top specialists in paleogeography, known for his works on the history of Man and Nature interaction. He was the first chair and founded he IGU Commission for Environment Evolution. At the time of his death he was the head of the Laboratory of Evolutionary Geography, within the Institute of Geography of the Academy of Sciences. He was renowned for his work in Late Cenozoic paleoclimatology and paleoecology of Early Man, as well as his expertise in the analysis of the environment and climate evolution. Dr Vasil’ev is a Professor with the Institute for the History of Material Culture at the Russian Academy of Sciences. He is a foremost archeologist whose studies are centered on the Early Man colonization of the middle and high latitudes of the Northern Hemisphere.